First up, the folks behind Sauce restaurant have opened the second outpost of their spin-off, Sauce Pizzeria. The East Village location opened in September at 345 East 12th Street, and now there’s a Lower East Side one at 184 Rivington Street, right next to Sauce restaurant. 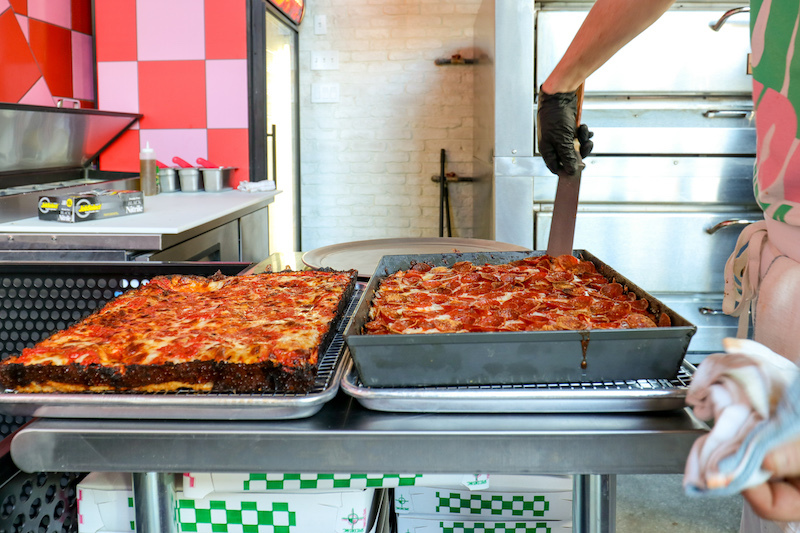 In addition to the original pizzeria’s thin-crust slices, meant to be dunked in various tomato sauces, the LES shop is offering some new square pies made with dough that mixes mashed potato into the flour. The upside-down pie layers tomato sauce over the mozz, and also includes pecorino, Sicilian oregano, and breadcrumbs. There are also right-side-up square pies topped with pepperoni, sausage, or vodka sauce. 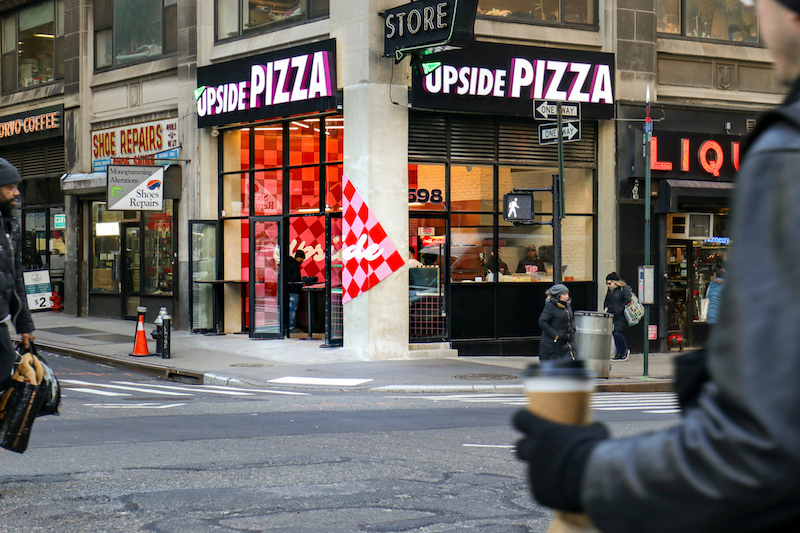 Also new on the square scene is Upside Pizza, which just opened in the Garment District at 598 Eighth Avenue, at 30th Street. Much like Sauce Pizzeria, which has a hip-hop-heavy playlist and portraits of rappers on the walls, this one is “inspired by growing up in the ‘90s, when nothing mattered more than sports, hip hop and great pizza,” according to the press release. As you can see above, the branding is a little Saved by the Bell, but the brick-oven pizza, made with unleavened dough, promises to better than what Zack and Kelly were served at The Max. It was created in consultation with Anthony Falco, the Williamsburg-based former “pizza czar” at Roberta’s. 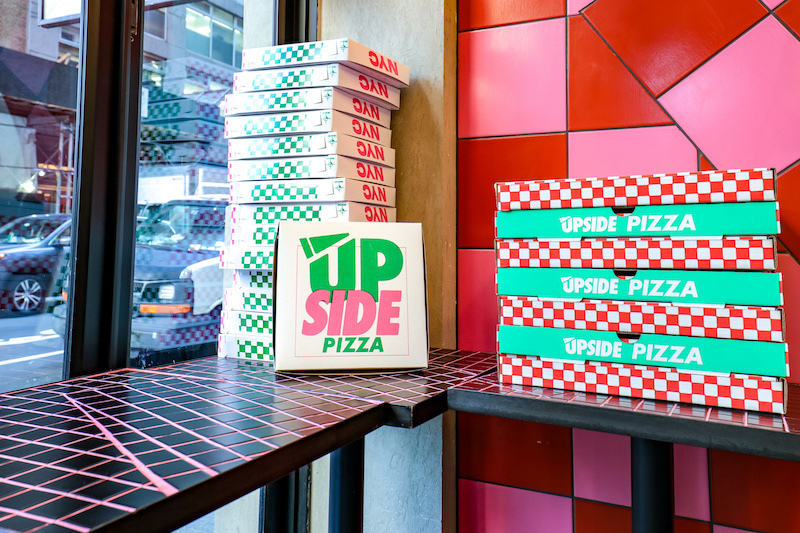 The upside-down pie is a two-inch-think Sicilian called the Upside Don. It features mozzarella, tomato sauce, breadcrumbs, oregano, parmesan, and olive oil. There’s also a The Wire-inspired Fuzzy Dunlop, topped with pickled chili peppers and sausage. Neither of these things are quite Rhode Island pizza strips, but that’s probably a good thing.